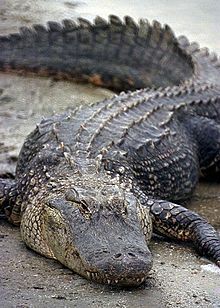 The family Alligatoridae of crocodylians includes alligators and caimans. The superfamily Alligatoroidea includes all crocodilians (fossil and extant) that are more closely related to the American alligator than to either the Nile crocodile or the gharial. Members of this superfamily first arose in the late Cretaceous. Leidyosuchus of Alberta is the earliest known genus. Fossil alligatoroids have been found throughout Eurasia as land bridges across both the North Atlantic and the Bering Strait have connected North America to Eurasia during the Cretaceous, Paleogene, and Neogene periods. Alligators and caimans split in North America during the late Cretaceous and the latter reached South America by the Paleogene, before the closure of the Isthmus of Panama during the Neogene period. The Chinese alligator likely descended from a lineage that crossed the Bering land bridge during the Neogene. The modern American alligator is well represented in the fossil record of the Pleistocene. The alligator's full mitochondrial genome was sequenced in the 1990s and it suggests the animal evolved at a rate similar to mammals and greater than birds and most cold-blooded vertebrates. The full genome, published in 2014, suggests that the alligator evolved much more slowly than mammals and birds. The lineage including alligators proper (Alligatorinae) occurs in the fluvial deposits of the age of the Upper Chalk in Europe, where they did not die out until the Pliocene age. The true alligators are today represented by two species, A. mississippiensis in the southeastern United States, which can grow to 15 ft (4.6 m) and weigh 1000 lbs (453 kg) and the small A. sinensis in the Yangtze River, China, which grows to an average of 5 ft (1.5 m). Their name derives from the Spanish el lagarto, which means "the lizard". In Central and South America, the alligator family is represented by six species of the subfamily Caimaninae, which differ from the alligator by the absence of a bony septum between the nostrils, and having ventral armour composed of overlapping bony scutes, each of which is formed of two parts united by a suture. Besides the three species in Caiman, the smooth-fronted caimans in genus Paleosuchus and the black caiman in Melanosuchus are described. Caimans tend to be more agile and crocodile-like in their movements, and have longer, sharper teeth than alligators. C. crocodilus, the spectacled caiman, has the widest distribution, from southern Mexico to the northern half of Argentina, and grows to a modest size of about 2.2 m (7.2 ft). The largest is the near-threatened Melanosuchus niger, the jacare-assu or large or black caiman of the Amazon River basin. Black caimans grow to 5.0 m (16.5 ft), with the largest recorded size 5.79 m (19.0 ft). The black caiman and American alligator are the only members of the alligator family that pose the same danger to humans as the larger species of the crocodile family. Although caimans have not been studied in depth, scientists have learned their mating cycles (previously thought to be spontaneous or year-round) are linked to the rainfall cycles and the river levels, which increases chances of survival for their offspring. Alligators differ from crocodiles principally in having wider and shorter heads, with more obtuse snouts; in having the fourth, enlarged tooth of the under jaw received, not into an external notch, but into a pit formed for it within the upper one; in lacking a jagged fringe which appears on the hind legs and feet of the crocodile; in having the toes of the hind feet webbed not more than half way to the tips; and an intolerance to salinity, alligators strongly preferring fresh water, while crocodiles can tolerate salt water due to specialized glands for filtering out salt. In general, crocodiles tend to be more dangerous to humans than alligators. Another recently discovered trait is that of both caimans and American alligators partaking of foliage and fruit in addition to their normal diet of fish and meat. ^ Family Alligatoridae (Alligators and Caiman) University of Bristol. Quote:"The Alligatoridae appears in the Upper Cretaceous while the genus Alligator first occurs in the Oligocene." ^ "American alligator". animals.nationalgeographic.com. National Geographic Society. ^ Naish, Darren (3 October 2008). "Tetrapod Zoology: Alligators eat fruit". scienceblogs.com. Archived from the original on 10 December 2008. "Family Alligatoridae Gray 1844 (alligator)", fossilworks.org.